D.C. McGannon is finicky about his coffee. And loves tea. And lemonade. Sometimes together. He has had a lifelong love of things that lurk in the dark, and loves moon gardening, hiking, and curiosity shops. 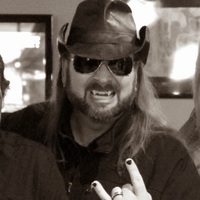 A writer, director, painter, and doodler, McGannon is co-author of the Charlie Sullivan and the Monster Hunters (Wyvern’s Peak Publishing) series of novels for young adults, and the dark fiction / horror collection KAOS Obsidere: The Nightmare Has Begun (Dark Waters Press). D.C. is one half of the humorous father/son duo The Monster Guys, bringing humor, horror, and all manner of comedic improv to live events. He plays a mean air guitar, and lives and dreams with Holly, Michael, Nathaniel, and their sweet puppy, Jewel, somewhere in the Mid D.C. McGannon is finicky about his coffee. And loves tea. And lemonade. Sometimes together. He has had a lifelong love of things that lurk in the dark, and loves moon gardening, hiking, and curiosity shops. D.C. is one half of the humorous father/son duo The Monster Guys, bringing humor, horror, and all manner of comedic improv to live events. He plays a mean air guitar, and lives and dreams with Holly, Michael, Nathaniel, and their sweet puppy, Jewel, somewhere in the Midwest. It's been a whirlwind of a year so far (and it's almost over...)! I hope you are doing well. D.C. McGannon said: " This has always been one of my favorite series. I am never disappointed with these stories. Can't wait for the next one...and the next one...and the next...you get the point! :) "
We’d love your help. Let us know what’s wrong with this preview of The Recalcitrant Project by Lauren Lynne.
" Thank you! Very kind words and we appreciate your honesty. And thanks for taking the time to share your thoughts! " Oh boy! I am so excited about this book for many reasons. This book definitely ventures from our young adult offerings and gives our dark fiction / horror-loving friends something to sink their teeth into. I had a ton of fun writing these stories with Oh boy! I am so excited about this book for many reasons. This book definitely ventures from our young adult offerings and gives our dark fiction / horror-loving friends something to sink their teeth into. I had a ton of fun writing these stories with my son and co-author C. Michael McGannon, yet at the same time, it was an emotionally, and sometimes physically, exhausting endeavor. I guess writing should be that, and though these are short stories, it took a lot out of me to get them on paper. Because of that, I felt I was doing my job writing these stories. There is still a lot I aspire to become, however, I am pleased to put this one before readers and lovers of dark fiction and horror. I give this five stars because I'm pumped about people reading this, and because I believe we've got some great material to share here. These stories are interconnected on many levels, and though it doesn't seem so coursing through the first couple of stories, it begins to become evident the deeper into the stories you read. The BONUS seventh story "Carnival Street" gives a small peek into the expanded world that will be explored in the second and third volumes of this series. Hold your hats, ladies and gentlemen, for what has been deemed "Creepy as hell," and "... visceral ... terrifying ...," and "wonderful ... and disturbing." For our first foray into the horror banner, I'm proud to offer you this read.